There are not many things that can instantly improve the quality of a working environment the way that a good desk fan can. If you are working at home or in the office or kitchen, the right kind of breeze and refreshing cool air can make a huge difference to your work ethic and enjoyment. But many factors need to be weighed to determine the absolute perfect fan for your particular work atmosphere. Read on to explore our definitive guide on the best desk fan available for you. Coming in at first place as the gold pick winner in our desk fan competition is the sleek and stylish Vornado Zippi Personal Fan. The overall futuristic appearance and innovative design of this fan make it not only attractive to behold, but also completely functional for almost any work environment. 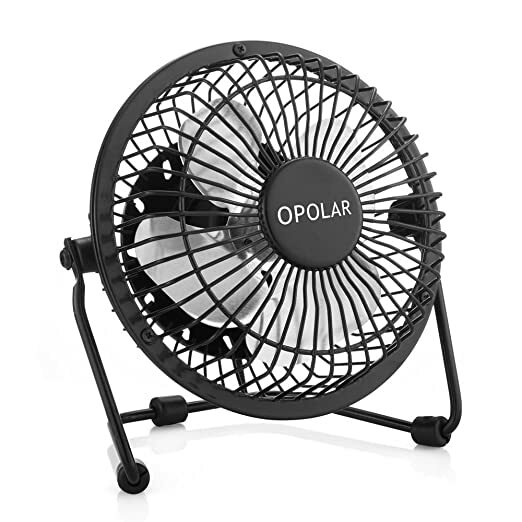 If you work in a large office setting, you and your co-workers will be thrilled by how incredibly quiet this fan is when in operation. While some other fans can make telephone calls or communications with co-workers more difficult, this fan will never distract from your conversations or distract you from the work at hand because of unnecessary volume. 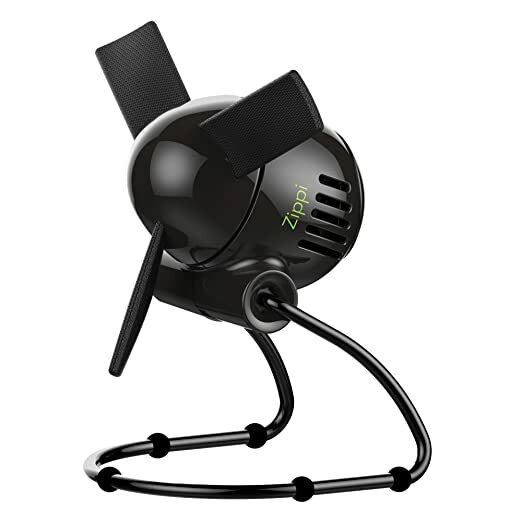 Vornado’s truly innovative design with the Zippi Personal Fan includes soft cloth blades. When you have a busy and crowded work station, it can be unfortunately commonplace to accidentally brush by a fan. An accident like this can be painful as your hand collides with fan blades, even on a small desk fan. The development of soft blades that are safe to touch even while the fan is in operation was an inspired idea. Small children or pets running into the fan won’t be hurt, and the sturdy plastic frame won’t be damaged either. The already tiny personal fan has a convenient folding design making it simple to take traveling or for storage when you don’t need it. But at such a low retail price, $25 normally, and discounted up to 40% on Amazon Prime, you’ll want to purchase one for every room in the house or office. Especially because Vornado pulled out all the stops with the modern and fun color options for this fan. With nine different options for color with names like ‘blueberry,’ ‘graphite gray’ and ‘sublime green,’ to name just three, you’ll be able to coordinate your fan to any design style you have in your home or office. The color on the fans is a brilliant bright hue with a high-gloss finish. It gives such a modern and hip attitude to this personal desk fan, which is not something one normally expects when purchasing a fan! Despite it’s small size, this fan does the job with an adjustable head and two-speed settings. Customize your own cool zone. Because the fan is almost completely silent, its even appropriate and attractive in a bedroom, and it won’t keep you awake at night. You might need to set a reminder for yourself to turn it off! But it’s small size doesn’t take away from just how powerful this personal desk fan is. It could also be used on an IT desk or other work space that is sometimes crowded with many computers at a time. It can be effectively used to cool computers that run hot, but you would need a larger size fan with more power for a task like airing out a stuffy room or drying paint. Where this fan may very well be used most is in cubicle type office environment. It will provide the perfect amount of background noise to your workday, unlike some of your neighbor’s old fashioned and unattractive desk fans. The fun color options give a pop of style and individuality to your work station. Weighing in at only 1 pound and measuring 5.5 x 4.5 x 6.2 inches, this fan is truly tiny. Because of it’s exceptionally low price point and three year satisfaction guarantee, the Zippi Personal Fan is the gold pick winner. Certainly do take advantage of the three year support plan. Its possible that with round the clock usage, this fan could need replacing. But Vornado guarantees your satisfaction by promising to replace the fan in the event of any mechanical issues. Make sure you request the manufacturer’s warranty from Vornado customer service. 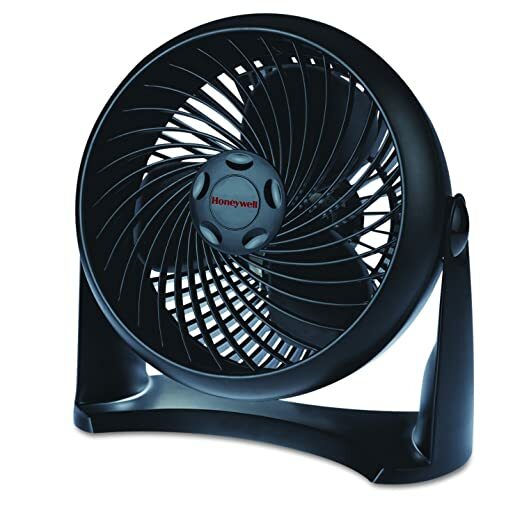 Coming in second place, our silver pick is the Honeywell TurboForce Fan. This small powerhouse is extremely lightweight at only 1 pound, but takes up slightly more room at 11.1 x 6.6 x 11.3 inches. But with that added size comes an extremely powerful personal desk fan with Honeywell’s aerodynamic TurboForce, designed for maximum air movement. What does TurboForce mean to you? It means that this fan is appropriate if you need to really cool down. It may be small, but it delivers powerful cooling action that can be used for personal comfort, to help cool down overheating computers and machinery, or for energy-efficient air circulation. This fan is completely appropriate for work or home, with a utilitarian design and a white or black color option. It’s also 25% quieter than models of a similar size, which means you won’t be annoying you co-workers or family while trying to keep cool. It’s been on top of the market since it was released, and has an extremely high satisfaction rate amongst customers. If size and space is an issue for you, this Honeywell power air circulator can also be mounted to the wall for your convenience. Even with the mounting option, the head of the fan pivots 90 degrees which means you can fully control a very wide comfort zone. With three speeds and a seven inch blade, you will feel powerful cooling action instantly. This fan also has the ability to be used as a white noise machine, since it is not completely silent. The calming and constant hum it elicits can help to drown out chatter in the office or at home without disturbing anyone else around you. Try it in a busy office where you are constantly distracted by the cubes around you and see how having some white noise can increase your productivity and enjoyment while you are at work. Because the seven inch blade is behind a plastic guarding grill, you will not need to worry about pets, small children, or your own distracted self accidentally brushing by and being hurt by the fan blade. However, this does make it slightly more difficult to clean out dust and debris from the interior of the fan. This can be remedied by using a long swiffer or similar product to dust inside while the fan it turned off. This fan is also an excellent choice for chefs or anyone that works inside the kitchen for many hours. It will cool down a kitchen hot from the oven, and also the cooks inside it. In cooler weather, it can also help to move hot air from a wood stove around a room, providing warming comfort as well as powerful air circulation. With an ability to cool you down quickly and efficiently, you may want to make sure to set the fan to oscillate, particularly if you are cooling a room with any infants or elderly folks. You might be surprised at just how effective this small fan can function! It also comes in at a great price point, listing at only $34.55 cents but with a 60% discount on Amazon Prime. That huge discount brings the overall price down to under $15 and makes this a fantastic buy. Coming in third, or our bronze pick, is the functional and futuristic OPOLAR Mini USB Table Desk Personal Fan. OPOLAR is paying attention to what is happening in office environments and at home, by providing a USB Power Source with a charging plug. 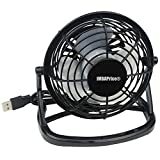 Instead of having yet another messy cable snaking over or under your work environment, you can now plug in and power this fan from your computer itself. If you are worried about drawing too much power while you are working, you have the option of the charger plug. This way you can have a completely cord-free personal desk fan that is perfect for your home, dorm room, or office, and can also be transported to a library or other study location with ease. The USB cable is 3.9 Ft. Long and compatible with laptop and desktop computers, as well as portable chargers and other devices with a USB output. With a sturdy and high quality metal frame, this fan is definitely a utilitarian device, though it does have a couple fun different color options such as a pastel blue and pink. The small size of the only six inch frame saves you desk or counter space and the four inch blade delivers remarkable cooling action. The portability of having a USB charger is intelligent and lets you travel easily with this fan wherever you need to feel refreshing cool airflow. It’s an excellent choice for a travel fan because of the aforementioned USB charging, but also because it weighs less than a pound. It will also provide a “white noise” effect if you are looking to drown out other noisy co-workers. It might be a fantastic ventilation tool in a garage or tent as well because of its light weight and sturdy frame. The charge on the fan lasts for an extremely long period of time. It’s not the quietest personal desk fan on the market by any means, but the sound is also not prohibitively loud to where it would disturb your office environment. It might not be the best option for a working professional that needs to spend several hours on the telephone. 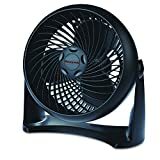 With a price point of about $25, and on sale for up to 48% on Amazon Prime with a low price of $12.99, this is a fan that can do the job no matter the working environment. It does seem to be especially designed to work optimally in workplaces with plenty of computers. It also has a one year replacement policy from OPOLAR for any product defects, and a live customer support line provided seven days a week. When you are uncomfortable while trying to work at your desk, the day can seem like an eternity. Now for less than the cost of lunch you can fix some of that discomfort and make your own personal cooling zone. 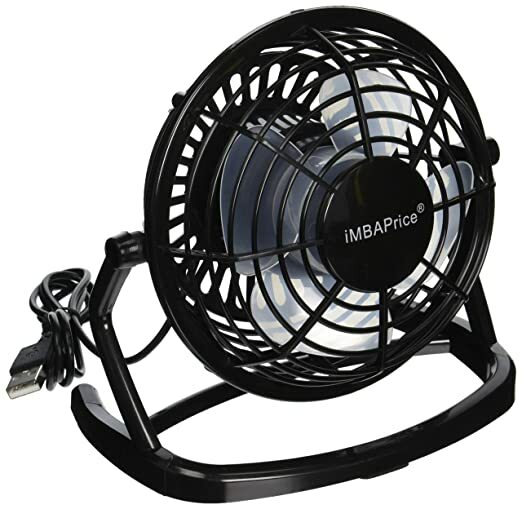 The Mini USB Desktop Fan from IMBA Price is highly rated and comes at the ridiculously inexpensive $6.79. Despite its low price, this tiny fan really does do the job. It weighs less than a pound and measures only 6.2 inches x 6.2 inches x 4.5 inches. It runs off of power from a USB port on your desktop computer, laptop, or any other USB power available. It’s probably most suited for an office type environment, but it has a 44 inch cord that is adequate for any size workspace including a kitchen countertop. This personal desk fan does tilt vertically but not to the left or right. If plugging it into your computer doesn’t sound like a good fit for you, you can purchase an extra adaptor for USB and use any standard wall plug. It is surprisingly quiet for such an inexpensive small fan, so you can plug in and not have to worry about disturbing anyone working within earshot. If the plastic frame has any buzzing or vibration you might need to adjust its location slightly to see what provides the most quiet comfort. The plastic frame is mountable so you can place it in a variety of locations around you to keep air circulating. Its light and small footprint makes it fit absolutely anywhere and be easily portable. Though you could easily cart it around with you, however, it might be best to leave this fan in a more stationery location. The plastic for the body of the fan and the casing of the USB cord is not constructed of the absolutely most durable material, but honestly for under $10, you’re getting more than what you pay for. Because it’s so small it can also be used for a number of tiny jobs like from cooling down the back of a computer tower to drying nail polish or as an aid in makeup application. Overall it’s a powerful little personal desk fan at a budget price that can’t be beat. In what environment will you use your fan? Fans can be such an advantage in such a multitude of situations and environments. From offices to busy kitchens, from spas to home use, a fan can instantly and drastically increase your comfort level and productivity. But you can’t just go and pick and old fan and expect it to work for your particular needs. It’s important to make a checklist of all the things you need a fan to do for you. Do you need a white noise machine to help quiet the humming of a busy office or be a sound barrier for others behind doors? Do you need to circulate air from one space to the next? Do you need to be able to easily transport your fan from one location to the next? 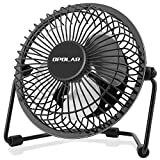 Quickly determine what you will most use your personal desk fan for primarily, and you’ll be able to easily choose to right purchase for you. How important is style to your product choice? From office to home, your personal style is reflected. For some people, utility objects like desk fans do not need to be carefully selected to match the aesthetic of their environment. But for others, everything in their periphery is a carefully selected addition to their personal style. Being able to make your space appear neat by hiding cords for ugly devices can help increase productivity and a feeling of well being. Color is not something generally seen in some standard office settings where a sea of computers and cubicles fill the room. So having a bright pop of color in your personal working environment can help showcase your personality and make you feel a little more at home. How long do you expect your fan to last for? As with all “personal” items that are meant primarily for usage with one buyer, you need to not get your sights set too far into the future for your product. That being said, there’s no reason to settle for something that breaks the first week you buy it, no matter how inexpensive it is. That signals bad workmanship of the manufacturer and is a company that doesn’t deserve your patronage. Regardless, sometimes you need to spend just a few dollars to get your self some instant cooling relief on a hot day at the office. At other times you might find yourself with more money and time to make a decision based on your specific needs for your personal desk fan. If it’s one you’d like to enjoy for a few years, make sure to contact the manufacturer for the warranty details they offer with your purchase. Having a fan in the workplace is an instant mood-lifter on hot and stuffy days. It allows you to circulate fresh air from a window into your work environment and feel uplifted by the scents of outdoors, or go to sleep at night with a cooling breeze. Being stuck in any one location while feeling hot is terrible for worker productivity and morale. In a kitchen, air circulation can be essential to help move fumes or to transfer hot air from an oven into a colder part of the house. In an office environment with multiple computer towers fans are used to cool down overheating machines and thus save them for overheating, which is far more expensive that a good desk fan. Hopefully by now you have realized what a tremendous benefit having a great personal desk fan will be to you as an individual. Make it a priority to get a model that works with your personal lifestyle, and you’ll be able to enjoy a cooling zone of your own while being happy and grateful for your purchase.